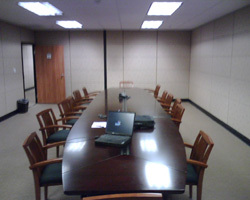 The TO&A Mission Viejo Court Reporting Suite offers an exceptional court reporting environment. Your busy law firm can take advantage of the convenience and professionalism of our well-appointed conference/deposition rooms and state-of-the-art audiovisual capabilities. Our experienced administrative staff is happy to assist you, and we are committed to providing our clients with memorable service and quality care.